Are your kids (or grandkids) already counting down the days to Hanukkah? Mine is. Last night my 5 year old prayed, "God, please help Hanukkah to come really really soon." Growing up, my parents made a big deal out of Hanukkah every year. Every night for a week we lit the hanukkiah, sang Maoz Tzur, binged on latkes and gelt, then tore into a big pile of presents. My Israeli cousins have long marveled about the hoopla we manage to generate. "It's only Hanukkah," they say, "what's the big deal?" Technically, Hanukkah is little more than a minor Jewish holiday - it isn't even in the Torah! Instead, the "command" to commemorate the Maccabees' victory over the Greeks is found in apocryphal literature (the Books of Maccabees). But it falls in close proximity to Christmas, and sometimes the holidays directly overlap with each other. Over time, this minor Jewish holiday has turned into a REALLY BIG DEAL, and mainstream retailers have taken notice. In 2017, you can put a Mensch on a Bench, top your Hanukkah bush with a magen David, wrap your gifts in shiny blue, and find Hanukkah decor for sale at Target. Amazon has gotten in on the game, as well. Thanks to the wonders of Amazon Prime, you can have the best Hanukkah bedtime stories on your doorstep in two days' time, or instantly download them as ebooks. Below is a roundup of my recent favorites. I hope they bring light and joy into your home, as they have in mine. "Hanukkah candles, shining bright. One more candle every night." Perfect for a toddler's short attention span, this colorful board book provides a lively introduction to the sights, smells, and sounds of Hanukkah. Your two or three year old is now big enough to light the candles (with assistance) and probably draws inspiration from the messy and delightful antics of George, the clumsy and cheerful monkey. Beware before ordering! Your little monkey will demand that you read this night ... after night ... after night. This is a lovely tale (published by Disney) of a young Jewish boy on his way to America. When his ocean liner crashes into an iceberg, Simon gives up his seat on a lifeboat for another passenger, and ends up stranded on an iceberg with nothing but his hanukkiah and a polar bear to keep him company. You can count on a happy and miraculous ending. Bravo to Disney for publishing a Jewish book that isn't afraid to honor a little boy's faith in God! Does your 4, 5, or 6 year old finally sit still for 5 - 10 minutes at a time? Mazal tov! You've entered a new phase of parenting. This is a great time to share the "real" story of Hanukkah - the tale of the Maccabees and their revolt against Antiochus, the Greek tyrant. Don't worry, there's no violence or gore. Instead, the book is filled with tales of heroism, miracles, and the rededication of the Holy Temple. "I know an old lady who swallowed a dreidel, a Chanukah dreidel she thought was a bagel…Perhaps it's fatal." Laugh together with your 5 - 8 year old as the old lady swallows oil, latkes, brisket, gelt, and candles, all leading to a large non-fatal "BURP!" Your 3rd through 6th grader will love this collection of Hanukkah-related Jewish folk tales from around the world. With stories from Iran, Israel, Poland, and America, Barbara Golden transports us to a new place and time each night of the holiday. Each story unpacks one of Hanukkah's many themes - religious freedom, commitment, faith, courage, tzedaka, rededication, honoring women, lights, and miracles. By age 11 or 12, your kid is totally too cool for picture books. Don't let the learning end with an eye roll. Instead, challenge your teen to join you in studying the real story of Hanukkah, by reading together and discussing the apocryphal books of I and II Maccabees. 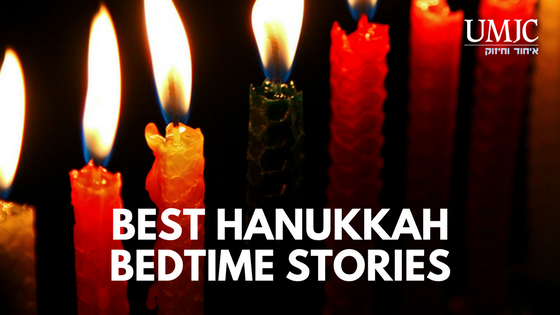 Do you have a favorite Hanukkah bedtime story that didn't make the cut? Comment below to recommend your favorites!